I was envisioning a large bull moose with a huge rack as I drove towards the mountains on an October morning. I knew my chances of finding the handsome specimen were good. 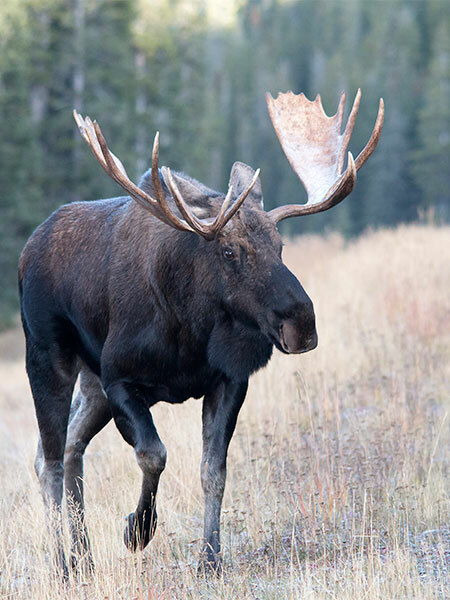 It was the heart of breeding season, when mature male moose are out looking for love, and I was heading towards Spray Valley, where the moose are plentiful. I was not disappointed. It wasn’t long before I came upon a group of about 10 to 15 people watching/photographing a large male moose. I joined the group, many of whom I know, and my friend Mike Kelly introduced me to his friend Donna Martin, who was visiting from Manitoba. The moose seemed pretty comfortable with all the attention (a lot of the Spray Valley moose are), but this guy was particularly relaxed. In fact, he decided to lay down in the tall grass right in front us (but a safe distance away). What a cool thing to see! ‘No, just everything, all of this is so amazing,’ she replied. The valley spread out before me, an icy glow emanated from the bushes, glistening with the early morning frost that powdered their delicate branches. 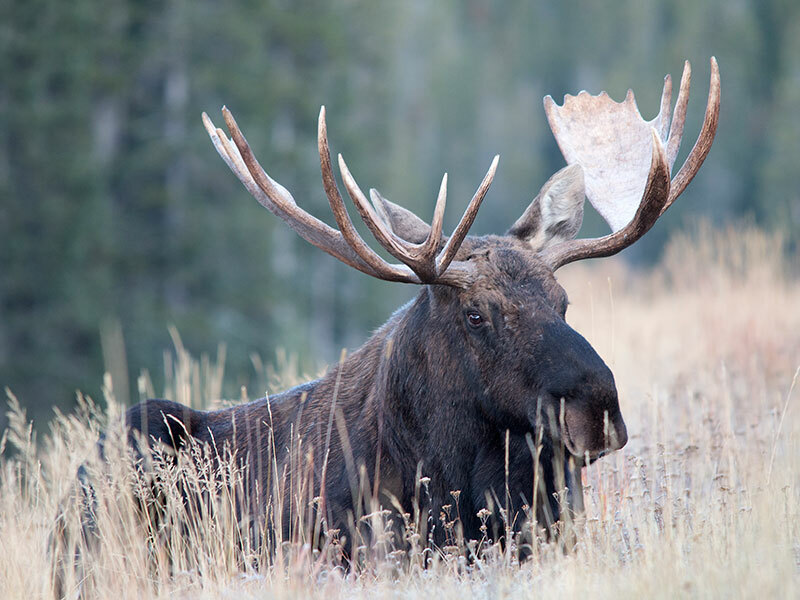 There were two more moose in view – both female – one grazing peacefully on the opposite side of the road and the other munching on the frost-crusted willows in the valley. The sun was rising behind the mountains, her orange glow slowly making its way over the vista. It was so remarkably beautiful – it’s amazing what you can miss when you are too focused on one animal! Thanks to Donna for reminding me to take in my surroundings.This was Donna’s first trip to the area – no wonder she was in such awe. I had been there so many times, and was so enamoured by the bull moose, I had forgotten to look around. What makes this valley even more remarkable is the fact that it is less than a two-hour drive from my front door in Calgary. Knowing this majesty is at my finger tips at any given moment is just one of the perks of living in one of the most beautifully diverse environments in Canada (or even the world?) – Alberta. The moose-laden Spray Valley, or Spray Lakes Road/Smith Dorrien Trail, is a 66km stretch that runs from the north-west corner of Peter Lougheed Provincial Park to Canmore. Aside from the abundance of moose, this stretch is home to grizzly bear, black bear, pika, coyote, various hawks and lynx – just to name a few. And this is just the wildlife – the landscape is absolutely stunning, with Spray Valley opening up at the summit of the road, in the arms of the surrounding mountains. In the winter, heading east will very likely result in at least a few snowy owl sightings, but I might also find Gyrfalcons, Prairie Falcons or Rough-legged hawks. In the spring or fall, I could come across huge flocks of migrating waterfowl, like Snow Geese or Sandhill Cranes. In the summer, there is no end to the potential for various shorebird/waterbird sightings. Weed lake, 40km east of Calgary, or Frank Lake, 6km east of High River both support a wide range of birds – too many to even attempt to name. Short-eared owls are not uncommon in the winter close to Frank Lake, and Great Horned Owls nest in the bunches of large poplar trees that speckle the eastern country side. My newly explored region of the foothills nestled between highway 2 and 22 (between Nanton and Claresholm) is known as the Porcupine Hills. This area supports the highest concentration of birds of prey in Alberta that I have ever found. 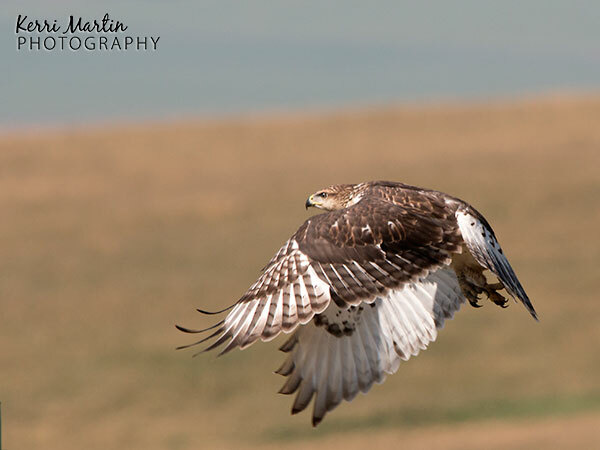 Prairie Falcons, American Kestrels, Northern Harriers, Swainsons Hawks, Red-tailed Hawks, Ferrigunious Hawks, Osprey, Merlins, Golden and Bald Eagles, Great Gray Owls. I have also seen several Dusky Grouse, a couple of Badgers, and a Black Bear in this area. The area north-west of Cochrane has long been known for Great Gray Owls, so I’ve done quite of bit of exploring in this region. Over the past year or so, thanks to Turbo inviting me on his treks, I have also gotten a chance to go further north and west to explore an area that is home to a large population of Wild Horses. This is by no means an exhaustive list (I didn’t even mention Banff, Jasper or Waterton), just a taste of what this amazing province has to offer in terms of wildlife. It’s overwhelming to think about the volume of possibilities I know about, let alone the thousands of areas I have yet to explore. Dan Arndt captured some images of Alberta’s only species of Lizard in the summer of 2013 – the short-horned lizard. When I first saw these images on Flickr, before he even had a chance to label them, I immediately sent Dan an urgent message – ‘OMG these are so cool! What the heck are they?’ I had no idea such a creature existed in Alberta. Finding the short-horned lizard means someday I will explore the dry prairies in the south-east corner of Alberta, in search of a 10 cm long lizard. 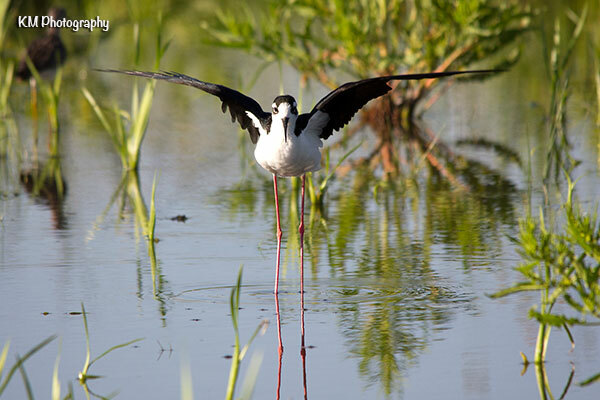 Check out Dan’s other images here and his birding blog here. I love snakes, and rattlesnakes are known to nest in certain spots in and around Lethbridge. I looked a few times this past summer when I was visiting my home town, but to no avail. Photographer Jeff Bingham has me aching to do more exploring in the ‘desert like’ area of Dinosaur Provincial Park, north-east of Brooks, where he has captured some amazing shots of the Prairie Rattlesnake. View more of Jeff’s photography here. Mike Kelly has me itching to head 3 to 4 hours north-east to Elk Island National Park, where there is a large population of wild bison. Mike got a chance to see a large herd of bison, including some babies, plus some frogs, coyotes, and stunning scenery on his May 2014 trip. This area is also now on my list. View the rest of Mike’s images on Flickr here. In 2014, some friends of mine made some amazing discoveries of rare/endangered species. Turbo and CrzyCnuk saw a Whooping Crane in Southern Alberta in the fall. You can read about their ‘whooper’ adventure here. See more of Turbo’s blog and CrzyCnuk’s images. 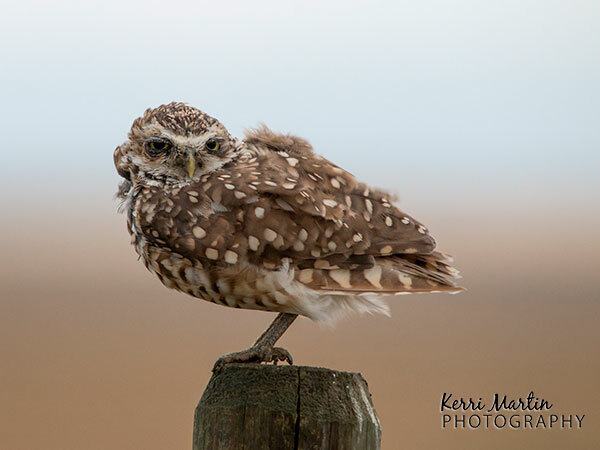 In the summer, Ron Kube found a family of Burrowing Owls in south-east Alberta, and as a result, I was lucky enough to be able to see two of them myself. See Ron’s images of the burrowing owls here (click on the arrow on the right to view more) and his full gallery of wildlife photography here. Both Whooping Cranes and Burrowing Owls are endangered and rarely seen in this province, but you just never know what you might find. This blog post could easily be a novel. I have barely scratched the surface of what Alberta has to offer in terms of wildlife and environmental diversity. I know Alberta has some complex social-political-economic-environmental issues, but those are best explored by a social-political-economic-environmental blogger. As a wildlife blogger, there is no shortage of material. I am truly grateful to live in such a remarkable area where I can so easily indulge my passion for the wild. If I’m around this summer (August-ish is the best time), I’d be more than happy to take you out to look for the short-horned lizards! There’s a ton of awesome prairie birds and reptiles down around the area this guy hangs out in, some of which can be hard to find unless you know the right habitats or micro-sites to look in! I would definitely be up for that – thanks Dan! I love Alberta, too 🙂 Wish I was there right now! Great story and photos.